Just a stone’s throw from public transport and within walking distance of the centre. Scandic Holberg is perfect for anyone who wants to experience city life on foot, or anyone coming to Oslo on a business trip. Set aside some time to explore the Bygdoy peninsula, the park Vigelandsparken or Aker Brygge. Our restaurant serves a delicious breakfast buffet. 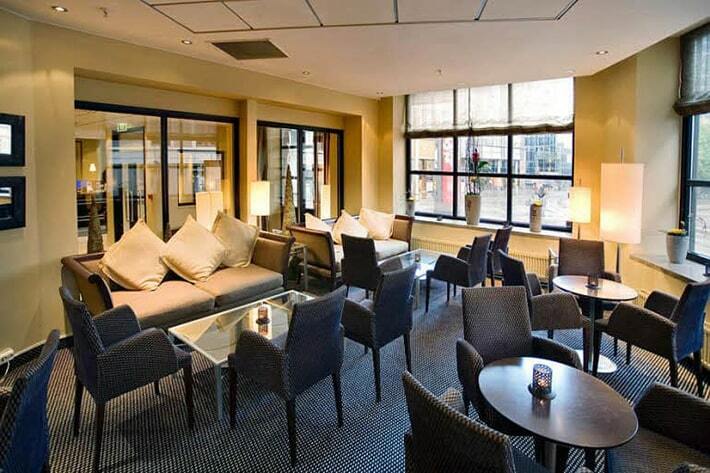 Our lobby bar is a popular place to relax over a coffee or a pre-dinner aperitif. If you are planning a meeting, conference or event, we can offer flexible facilities for up to 70 participants. We offer free WiFi, and for guests arriving by car, there is parking 100 metres from the hotel. Scandic Holberg is located in the centre of Oslo, right by Slottsparken, and within walking distance of Bogstadveien, Majorstua and Karl Johans gate. Here you will find shops, restaurants and theatres in the immediate vicinity. There are excellent transport options right outside the door, with tram stops just a few metres away and a 10-minute walk to the Nationaltheatret station. If you would prefer not to use public transport, you can borrow bikes from the reception – perfect for exploring the city, Bygdoy, Vigelandsparken or Aker Brygge.